Manitex Liftking is a North American manufacturer of a complete line of Rough Terrain as well as other Specialized Heavy Material Handling Equipment. They have been in business since 1968 and have a dedicated workforce of over 150 employees. Manitex Liftking has been manufacturing Rough Terrain Forklifts and other Material Handling Equipment for commercial and military applications for over 30 years. Manitex Liftking has over 6,000 units operating worldwide and more than 170 Dealer Locations that sell and service Manitex Liftking units around the globe. Manitex Liftking has proven over the years it can compete on quality, specifications, ergonomics, price and delivery in the Material Handling field. Are your operations being undertaken in rough conditions? Areas with limited access? Wet areas? Sloped/uneven and unpaved ground? 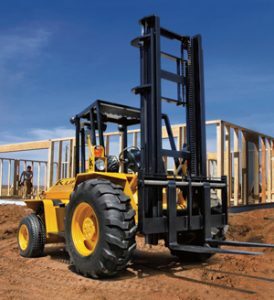 All terrain forklifts feature a larger, wider wheel base for increased traction and stability, better suspension and drives, and a range of other features that make them a more versatile option for rough outdoor applications. 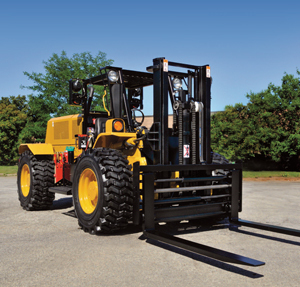 New and second hand forklifts from the LiftKing range are straight mast models from 2.5 to 27.5 tonne capacity. 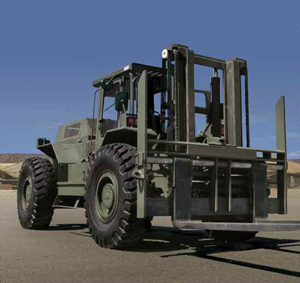 The company has been manufacturing these rugged vehicles and other materials handling equipment for commercial and military use for more than 40 years, and has built a reputation for quality and reliability. Vehicles are available in 2WD and 4WD, with extensive cab comfort options, side shifting masts, diverse transportability options and a range of other features, ensuring that we can source a model to suit your needs. Minimal electronics make these vehicles the best option for rough, dusty environments, from remote regions to building sites. Commonly used in mining, construction and military environments, these vehicles are also a more versatile option for events, housing construction, civil construction and more. 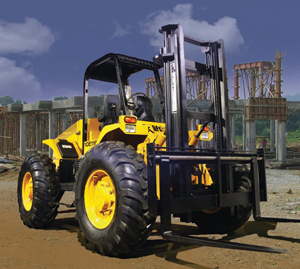 We have a versatile range of equipment in our fleet, including 4WD forklifts, telescopic handlers and container handlers, along with used Hyster forklifts and a range of other brands, available for purchase as well as short or long-term hire. Supplying maintenance manuals, providing technical support, sourcing parts and assisting you in finding quality service providers are all part of our comprehensive after-sales service. For more information on materials handling equipment that’s ready to perform in challenging conditions, contact us today; we can help you make the right choice, first time.